New Delhi: The World Bank has approved a US$1.5 billion loan for the Swachh Bharat Mission (SBM) Support Operation Project to support the Government of India in its efforts to ensure all citizens in rural areas have access to improved sanitation – such as a toilet or latrine with a focus on changing behaviors – in ending the practice of open defecation by 2019. Specifically, this project will support the rural component, known as SBM – Gramin (SBM-G), over a five-year period using a new performance-based program which links funds directly to results, ensuring that benefits are delivered to the people in need – more than 60 percent of India’s rural population. Today, of the 2.4 billion people who lack access to improved sanitation globally, more than 750 million live in India, with 80 percent living in rural areas. More than 500 million of the rural population in India continue to defecate in the open, suffering from preventable deaths, illness, stunting, harassment and economic losses. The SBM-G program focuses on ensuring usage of toilets along with their construction. States and their implementing agencies will be given incentives for meeting performance standards. Performance will be measured against the states’ ability to reduce open defecation, sustaining their open defecation free (ODF) status and improving solid and liquid waste management in rural areas. The financing mechanism promotes the leadership of the states, which will have flexibility in innovating and adopting their own delivery models. 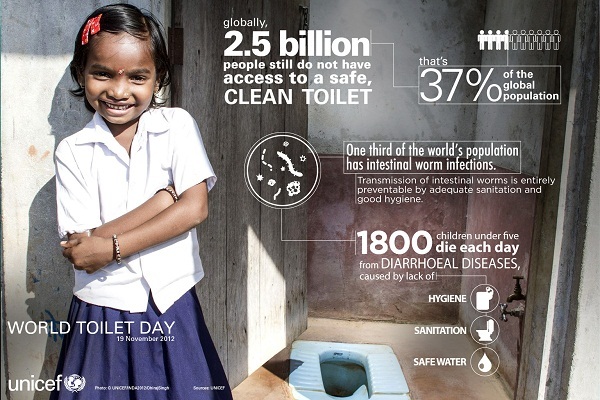 One in every ten deaths in India is linked to poor sanitation. And studies show that low-income households bear the maximum brunt of poor sanitation. This project, aimed at strengthening the implementation of the Swachh Bharat Initiative of the government, will result in significant health benefits for the poor and vulnerable, especially those living in rural areas. “Incentivizing good performance by states and the focus on behavioral changes are two important components of this project Onno Ruhl, World Bank Country Director for India. The Ministry of Drinking Water and Sanitation (MDWS) will play the overseeing and coordinating role for the Program and support the participating states. Funds will also be used to develop the capacity of MDWS in program management, advocacy, monitoring and evaluation. India has demonstrated extraordinary leadership in pursuing the ambitious SBM campaign and embracing the focus on behavior to complement the construction of toilets. It is our privilege to support the Indian government in this initiative and we look forward to working side by side. Annette Dixon, World Bank Vice President for the South Asia Region. The World Bank will also provide a parallel US$25 million technical assistance to build the capacity of select state governments in implementing community-led behavioral change programs targeting social norms to help ensure widespread usage of toilets by rural households. This program, built on lessons learnt from global and national sanitation projects, represents a fundamental change in approach and recognizes the importance of coupling investments in the construction of toilets to its usage. For it to succeed, large-scale social mobilization for behavior change is critical at the community level. hird party assessments and regular monitoring will provide reliable information on the project’s progress Soma Ghosh Moulik, Lead Water and Sanitation Specialist and the project’s Task Team Leader. Progress towards the key indicators – which will form the basis for releasing incentive grants to states – will be measured through independent verification assessments. National Annual Rural Sanitation Surveys will be carried out annually by a third party. The loan, from the International Bank for Reconstruction and Development (IBRD), has a maturity of 18 years including a grace period of 5 years.